Vegan chicken? 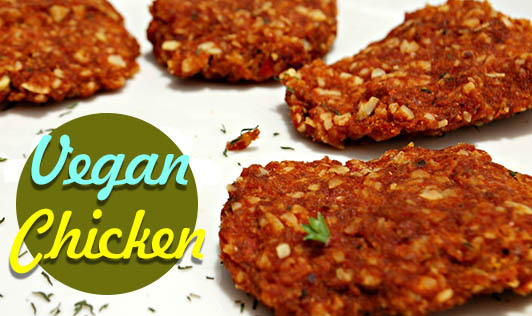 That may sound like a perfect oxymoron, but vegan chicken is just an imitation chicken. This is made of soya chunks and has an appearance, taste, and texture very similar to that of chicken. Not just that, the vegan chicken mimics chicken even in terms of properties and culinary role. So your vegan chicken can be barbequed, pan fried, cooked, etc. just as applied to chicken. You can also add herbs, spices, dehydrated vegetables, seasonings and sauces to it just as it is done to flavour chicken that comes from the poultry industry. In fact, vegan chicken is available in commercial packs that also look so much like the non-vegetarian chicken packages. Even the methods of preservation is similar. While it is common in a few nations, vegan chicken is still new to the Indian market, finding place on the shelves of food stores. But the good news is that it is far more reasonable and hygienic as compared to the non-vegetarian chicken. The most obvious advantage is that vegetarians can try out chicken recipes by substituting these processed soya chunks instead of regular chicken. This will not just add to the variety and taste in the vegan/vegetarian diet, but will also appreciably contribute to the protein intake. And for those non-vegetarians who have turned into vegetarians and miss their favourite chicken, now you can try this one!